1 Preheat the oven to 180°C, gas mark 4. For the walnuts, place the sea salt and sugar in a pestle and mortar and pound into a powder. Place the walnuts on a baking tray, sprinkle over the powdered salt and sugar and toss well until evenly coated. Roast for 5–7 minutes until golden then remove from the oven and set aside to cool. 2 For the soup, melt the butter in a large saucepan. Add the shallots and celery and cook for 5 minutes until starting to soften. Stir in the pears and cauliflower, toss together well then pour over the stock. Simmer for 15–20 minutes until the cauliflower is tender. 3 Stir in the crème fraîche, most of the blue cheese (reserve a little for garnish) and parsley. Simmer for 5 minutes then remove from the heat. Blend the mixture until smooth. 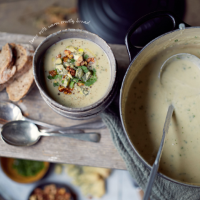 4 Ladle the soup into serving bowls and sprinkle with the walnuts, reserved blue cheese, extra parsley and a little ground black pepper. Delicious served with crusty bread. store in an airtight container. Prepare the soup to the end of step 3, leaving out the crème fraîche. Pour into a rigid, freezer-proof container and leave to cool completely. Freeze for up to one month. To serve, defrost thoroughly before heating through until piping hot, then stir in the crème fraîche and garnish as step 4.